Rabbi Glick stated that the number of children in the Dnipropetrovsk homes continues to decline from year to year, although the loss has been less dramatic recently. At the time of the writer’s visit in May, 21 boys between the ages of six and 17 resided in the boys’ home, a renovated former synagogue, and 15 girls lived in the girls’ home, a former private residence. In the past, the residential program had accommodated as many as 40 boys and 28 girls. The decline in census reflects the general Jewish demographic decline and “competition” from relatively new similar programs operated by rabbis in nearby Krivoy Rog and Zaporizhya. All of the youngsters are halachically Jewish, said Rabbi Glick, and all are enrolled in either the yeshiva katana or the machon. In response to a question about further education of these adolescents after they leave the homes at age 17, the age of high school graduation in Ukraine and Russia, Rabbi Glick said that post-graduation programs remain “the biggest problem, a headache every year.” Graduates need a support system, he acknowledged, but Tsivos Hashem lacks the resources to provide continuing guidance. Some boys find sponsors for yeshiva study in the United States, and others enroll in local colleges or institutes. However, acknowledged Rabbi Glick, he and his colleagues lose contact with many of their previous charges; additionally, he said, 17-year olds do not always make wise decisions. He is aware that some are not successful in their adult lives. In response to a question about the economic viability of the residential program, Rabbi Glick said that allocations from Tsivos Hashem continue to decline and the subsidy from the Chabad Philanthropic Fund of the Dnipropetrovsk Jewish Community (Благотворительный фонд Днепропетровского еврейского общины) does not cover the funding gap. The last few years have been “very tough” due to the global economic situation, he continued; fewer donors are coming forward. This year (2011-2012) has been “the worst” in terms of fundraising in all of the years that he has been in Dnipropetrovsk. Accordingly, plans to renovate the badly dated boys’ home have been scrapped, and construction of an apartment for house parents in the girls’ home also has been postponed indefinitely. Youngsters residing in the homes have fewer recreational opportunities than previously. Staff have not been paid for two months, noted Rabbi Glick, and this is not the first time that he has been unable to meet payroll obligations. 5. 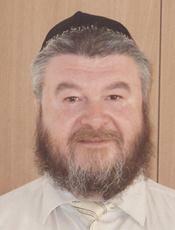 Iosif Masakovsky, a local individual previously employed as a computer technology instructor, manages a continuum of Chabad Jewish education programs open to halachically Jewish young people. Participants are subsidized for attendance and achievements as measured on periodic examinations. About 650 young adults are engaged in these programs, but only about 350 appear to be really active and committed. These 350 receive stipends for their involvement, said Mr. Masakovsky. The previously touted STARS (Student Torah Alliance for Russian Speakers) courses have declined in scale, Mr. Masakovsky stated. Some participants, he and others stated, enrolled in the program under false pretenses; they were not students and were, in fact, incapable of absorbing the college-level Jewish curriculum that had been prepared for them. A number of them had limited intellectual capacity and/or psychological or emotional issues. They were disruptive in class. Their motivation for joining the program was receipt of Chabad stipends. Even some young people who successfully completed the course had shown that their primary interest had been receiving subsidies. As soon as their courses of study ended and the grants ceased, he explained, many of them broke with the community and declined any further involvement with Chabad. Today, Mr. Masakovsky continued, most compensated courses of study proceed under the general rubric of Shiurei Torah (Heb., Torah Lessons). Several formats exist, including “770” (so called because 770 Eastern Parkway is the address of Chabad world headquarters in Brooklyn), which requires six classes per week. All students must be halachically Jewish and all classes are gender-segregated, although some social events are held in an effort to encourage contact between halachically Jewish young men and women. Most of the instructors, said Mr. Masakovsky, are baalei tshuvah (בעלי תשובה; previously secular Jews who become Orthodox) of Russian-speaking background, some of whom have lived in Israel for 10 to 15 years. Such individuals, Mr. Masakovsky continued, understand the Russian psyche and often are very effective teachers. The impact of these programs is clear, Mr. Masakovsky asserted. Dnipropetrovsk has seen many more traditional Jewish weddings in recent years, followed by a growth in the number of local Orthodox families. Stipends are an effective instrument in encouraging traditional Jewish education, he said, but then young people continue to follow observant Jewish lives on their own without financial incentives. Iosif Masakovsky is a local individual, largely self-taught in Judaism. He manages an extensive program of Jewish education courses in which halachically Jewish participants, mostly young adults, are remunerated for attendance. 6. Olga Tovkach continues to direct the Hillel student organization in Dnipropetrovsk with considerable success. Ms. Tovkach reported that Dnipropetrovsk Hillel has about 1,000 names in its data base; up to 250 unique individuals participate in at least one Hillel activity every month, she said. In all, she continued, the 201-2012 academic year then coming to an end has been highly successful for Hillel. Facilitating increased student participation has been a Campus Entrepreneur Initiative in which seven trained student interns have conducted outreach activities at the three largest universities in the city. 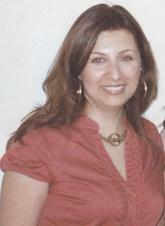 They have indeed engaged Jewish students not previously involved in any Jewish activity, said Ms. Tovkach. Another successful tactic has been the staging of many meetings and events in cafés and other neutral spaces. Much “resistance” remains among students to attendance at activities in or near a synagogue, she continued; clearly, young people are more comfortable in premises not connected with religious practice. Hillel also has attracted new participants through large-scale non-religious Jewish events, such as a big Purim party, Ms. Tovkach said. However, Jewish religious tradition can be palatable when it is introduced through a gradual and voluntary program; Hillel distributes simple Shabbat kits to interested individuals who then learn how to conduct a Shabbat dinner through a brief series of lessons. Asked about programs that are particularly popular, Ms. Tovkach responded that Shabbatonim held at a site outside the city draw as many as 160 students. Obviously, such events are costly; students are expected to pay a fee, but not all do so. JDC has been helpful in covering some of the expenses, Ms. Tovkach noted. The madrichim (leaders) for Shabbatonim are trained through various Hillel seminars and workshops. They volunteer their services without compensation. Olga Tovkach, left, has revitalized Dnipropetrovsk Hillel in recent years, bringing to it a sense of vitality and innovation. Hillel activists also enjoy volunteer work, Ms. Tovkach continued. They organize holiday celebrations at Beit Baruch, the assisted living center for senior adults. They also deliver food parcels to bedridden seniors (лежающие) and do repair work in the homes of elderly people. They organize major events (such as picnics or holiday celebrations) for the Big Brother/Big Sister program, hosting as many as 60 pairs of children and their volunteer older siblings. Many Hillel activists themselves are big brothers or sisters, noted Ms. Tovkach. During Good Deeds Week (Неделя добрых дел), Hillel participants entertain pediatric cancer patients who are in children’s hospitals. Hillel students also have undertaken other charitable endeavors, such as raising funds for musical instruments needed for children’s musical ensembles. Hillel continues to organize intellectual games on Jewish themes (similar to Jewish trivia contests), which remain very popular in the post-Soviet states. The Dnipropetrovsk Hillel team has competed in a large Ukraine-wide Hillel Jewish trivia tournament in Odesa, she noted. Another intellectual pursuit is the study of Jewish given names; Hillel encourages its members to adopt their own Jewish names after studying the meanings of various first names and relating their findings to their own family history. 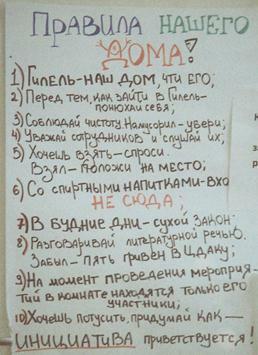 A wall poster entitled Rules of Our Home occupies a prominent position in the Dnipropetrovsk Hillel office. Among other things, it admonishes Hillel members to: observe cleanliness; respect co-workers and listen to them; ask before taking things and if something is removed, put it back in its proper place; not bring alcoholic drinks into the premises; use ‘literary speech’ in conversing with people – and if you forget, put five hryvnia into the tzedekah box. Jewish education remains a problem area for Dnipropetrovsk Hillel, noted Ms. Tovkach. The most recent staff person to hold this portfolio resigned and now Hillel is attempting to find another qualified individual for the post. Responding to a question about interaction with Hillels in foreign countries, Ms. Tovkach said that a group from the University of Maryland Hillel came to Dnipropetrovsk for an alternative spring break program. They spent seven days in the region, including a Shabbaton and a three-day segment in Donetsk, a large industrial city to the east in which the local Hillel is a recently-started endeavor. While in Donetsk, continued Ms. Tovkach, the Maryland group did volunteer work with Jewish elderly, children, and a group of special-needs children. Ms. Tovkach commented that the visit would have been more productive for Ukrainian Hillel members if it had occurred during a local vacation period; because their American guests arrived during regular academic classes, local Hillel-member students were unable to interact with the Marylanders as much as all would have liked. The American yeshiva that Dnipropetrovsk boys most often attend is operated by an individual with close ties to Chabad in Dnipropetrovsk. In the past, Rabbi Glick has spoken of girls who are recruited to religious seminaries in Israel and drop out shortly after beginning their study programs, overwhelmed by religious constraints in such institutions. The Campus Entrepreneur Initiative is an international Hillel program that also is active in the United States and other countries. The current Hillel office is located in a small Jewish community center attached to the Golden Rose Choral Synagogue (Chabad). When the Menorah Center is complete (see pages 7-10), Hillel will transfer its office and activity space to that facility; it also is located adjacent to the Chabad synagogue, a fact that Ms. Tovkach did not address. See pages 25-27 for more information about Beit Baruch. For more information on the Big Brother/Big Sister program in Dnipropetrovsk, see the writer’s Observations on Jewish Community Life in Ukraine March 21-April 8, 2011, pp. 16-17.